After being told off by the new leadership of the Democratic Republic of Congo, president Edgar Lungu has denied demanding a recount of the vote in DRC. In the video on our Facebook page, Lungu’s minister of foreign Affairs Joseph Malanji is heard stuttering to explain what Lungu meant when he said there should be government of national Unit in Congo. Contrary to Amos Chanda’ statement that is clearly demanding a government of national unity, Malanji says Lungu merely suggested to the winner to include the losers in his government. The whole regional and international media is awash with news quoting Lungu saying SADC wants recount of votes. The statement was issued by Lungu’ spokesperson Amos Chanda instead of the SADC secretariat as common sense would suggest. Apparently Lungu is supporting the losing candidate Fayalu and is trying to ride on a statement by the Catholic Church casting doubt on the outcome of the elections. Yet Lungu does not listen to the Catholic Church in Zambia. But Lungu is being viewed as a hypocrite as he refused the intervention of SADC After the 2016 disputed Zambia elections. Lungu refused to accept the SADC involvement in resolving the dipute arguing that elections in Zambia were an internal matter which did not warrant outside involvement. He convinced the then RSA President Jacob Zuma to treat the case as such. Today, in the case of Congo DR, he is championing the SADC involvement in order to satisfy his personal desire. He is calling for a inclusive government as this will help to accommodate the candidate, it is understood, he supported in the name of Fayulu. Fayulu is working with Moise Katumbi who is a personal friend of Lungu. It is believed that former Zambia army commander Paul Mihova and his deputy were fired for refusing to send soldiers to DRC to safeguard the interests of katumbi and Fayalu. Now this has become a fight between Zambia and the new leadership of Congo. The excitement of Lungu to dispute the DRC elections is quite baffling. Even the statement he made was inscribed on Zambian StateHouse Logos and signed by Lungu’ spokesperson Amos Chanda. If this was a SADC position, the statement should have been issued by the SADC secretariat. Let’s hope the SADC secretariat will not issue a contradictory statement. Lungu should stay away from DRC elections and concentrate of addressing corruption and tribalism in his own government. 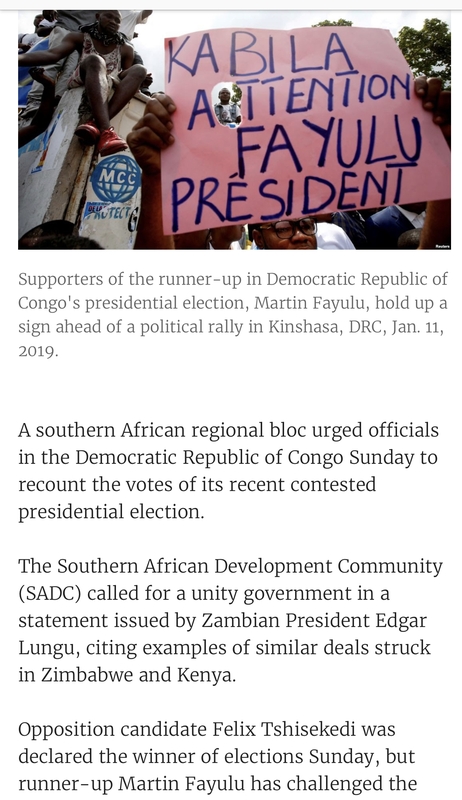 It will be very embarrassing for Lungu to finally eat humble pie and accept the new president of DRC.